Well, my mouth dropped open on entering. There’s a reason Café Central is so popular with tourists. Just go. Seriously, in a city of great coffee houses, this might just be number one. I’ve walked past Café Central a dozen times, and each time there was a queue. “Clearly a tourist trap,” I thought. And besides, there are plenty of other coffee houses in Vienna. But then curiosity got the better of me. Thank you, curiosity…I owe you one. As you walk through the door, a majestic, vaulted, and columned room opens before you. And just as you thought your jaw could not drop any lower, the cake display hits you; they should move it to the Albertina, for it is a work of art in its own right. So, yes, I was impressed. Now, a place of such magnificence has to have a catch and it’s usually the staff. Ah, wrong again. We were welcomed warmly on entering and, watching from afar, I could see waiters chatting and smiling with each other. Smiling! I had to check I was still home in Vienna. Our waiter was particularly friendly. And fast. And thoughtful. For example, Café Central has an in-house patisserie to create those pieces of culinary art, and my wife’s slice of cake arrived with two forks – just in case I might like a taste. After presenting a bill, the waiter would always pull back a step or two to give fumbling people time and space to find their money. No pressure, not even with a queue outside. We went at 8 am, midweek, in early February and had no trouble getting a table immediately. But be warned – queues are likely later in the day and pretty much anytime outside late January and early February. Café Central serves more than 550,000 guests each year and is incredibly popular. But deservedly so, I’d say. Back to those little touches that go beyond the usual coffee house experience, like organic butter with breakfast, scoring 10/10 on the spreadability index, the roll pre-sliced, the croissant the size of a cow, jam in a sealed collectible jar you can take with you. Oh, and the collection of morning newspapers included that day’s New York Times (international edition). I could go on. Red patterned upholstery, burnished metal lamp fittings, brown marble tabletops on wood and brass pedestals, and those classic worn bentwood coffee chairs. Consider the coffee house checklist duly ticked. And everything spotless. Not to mention those columns and vaulted ceilings that impress on entering. The building itself (Palais Ferstel) dates back to the mid-19th century and once housed the Vienna Stock Exchange and the National Bank. You can tell. At one end, you may even breakfast beneath portraits of Emperor Franz Joseph and Empress Elisabeth. 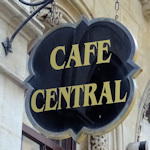 A little kitsch, perhaps, but then Café Central first opened during their reign, in 1876. In the years that followed, the coffee house grew into a meeting place for the intelligentsia of Vienna and beyond. Freud drank here. As did Kokoschka, Loos and Schnitzler. But also Trotsky. Probably Tito, Stalin and Lenin. And perhaps even a young Hitler, though you won’t find that possibility mentioned much. Palais Ferstel actually suffered significant damage in WWII and Café Central closed, only reopening in the 1980s. A place truly rich in tradition, given that guest list and history. The menu is quite extensive, stretching through the day from breakfast into snacks, lunches and evening meals, with a strong focus on traditional Viennese cuisine. They recently (2019) revamped the breakfast menu to incorporate more organic food and additional alternatives to that traditional fare. Café Central is not cheap, but I actually thought it would be more expensive given the location and popularity. In the course of the morning, numerous tourists popped in, brandishing smartphones and posing beside the cakes (but who wouldn’t?). Equally, various well-to-do locals joined us, and the atmosphere remained discretely traditional, despite the mix of guests. What happens at peak hours, though, I cannot say. All-in-all, if you don’t mind the possible wait, Café Central qualifies as a must-do on your Vienna itinerary. The name is a bit of a giveaway when it comes to location. Café Central sits right in the centre, just a short walk from the Hofburg palace. At the time of visiting (February 7, 2019), open daily from 7.30 am to 10 pm (Monday to Saturday), 10 am to 8 pm (Sundays and holidays). Closed December 24th.